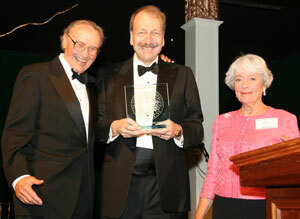 Chancellor Blumenthal (in top photo) presents the Fiat Lux award to longtime UC Santa Cruz supporters Roland and Pat Rebele at the third annual Founders Day Dinner, Friday, October 23 at the Cocoanut Grove in Santa Cruz. 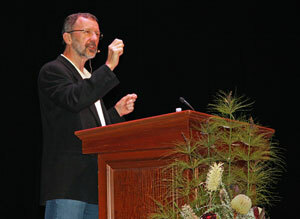 Also receiving awards were Ed Catmull, president of Pixar and Disney Animation Studios, winner of the UC Santa Cruz Foundation Medal; John Rickford, professor of linguistics at Stanford University, winner of the Alumni Association Award; and economics professor Dan Friedman, Faculty Research Lecturer, the foremost academic research honor bestowed by the Santa Cruz Division of the Academic Senate. The gala event was a sell-out as nearly 400 guests celebrated the theme of "Fulfilling the Promise" of UCSC's founders more than four decades ago. Earlier in the day, Catmull (in lower photo) gave the address at the annual UC Santa Cruz Foundation Forum, speaking on the topic "Creativity: What I Don't Know and What I Know." Founders Day Dinner topped off a week of events celebrating Pixar.